Drifting snow can reduce visibility to treacherous levels, trigger ice formation and result in a loss of vehicle control. Other consequences of snowdrifting include pavement damage and increased snow clearing costs. 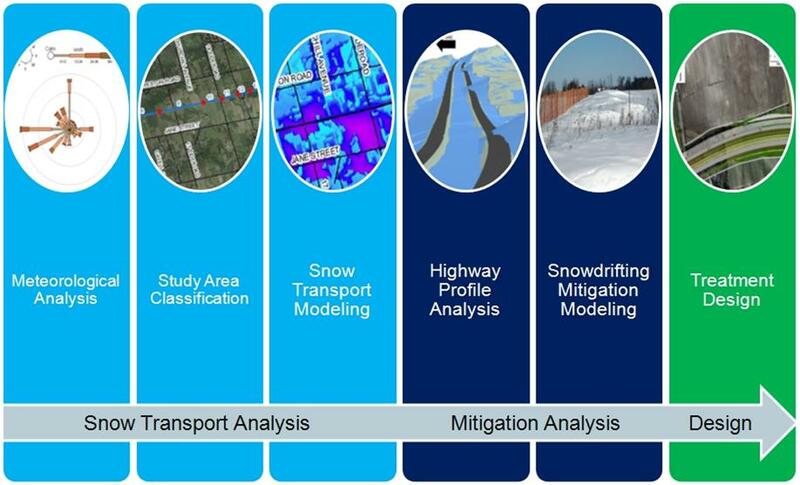 4DM offers an end-to-end snowdrift analysis and management solution. We collect and use meteorological and spatial data, analyze collision statistics, and make field observations to derive snow transport processes and assess snowdrift potentials. We then assess various mitigation scenarios and rank them based on their snow retention efficiency and cost effectiveness. Our comprehensive analytical toolkit, including powerful visualization capabilities, gives us the ability to assess the impact of various possible solutions such as snow fences and trees or hedge plantings and to devise the best methods of implementation (e.g. locations, orientation, height, etc.). 4DM can help you find the best solution to your snowdrift problems.